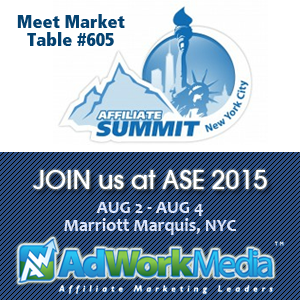 AdWork Media is proud to attend this year’s Affiliate Summit East 2015, hosted at the New York City Marriott Marquis, Aug. 2 – Aug. 4. Affiliate Summit is the premier conference for the Affiliate Marketing industry and is completely sold out again this year! If you happen to be attending this event please contact us to arrange a meeting or a quick greet with the AdWork Media team. Visit us at the Meet Market on Aug. 2, Table #605. Attendees get a chance to win $500 and more prizes! Thank you for coming to Affiliate Summit and exhibiting. We hope to see you in Las Vegas in January.